Get more Pygite and slay monsters with ease, thanks to our newest guide. 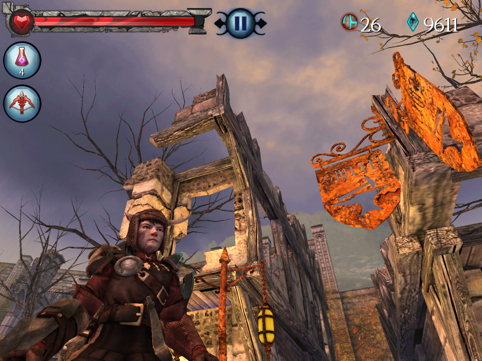 Phosphor Games Studios made quite an impact on iOS this week with Horn, a powerful action RPG featuring a young boy making his way through a fantasy world filled with monsters. Not only is it immensely entertaining, but also a bit tricky, as players run into tough enemies and plenty of puzzles along the way. To give you an edge, we forged this Horn cheats and tips guide that, as legend has it, is made of pure Pygite crystal. What the heck's Pygite? Let's begin. As you'll soon learn, unlocking (ahem, forging) the best weapons in Horn requires thousands of Pygite crystals and a few Cores for good measure. You can scour the game world in search of virtual currency, or spend money to acquire more. Here's what you'll be able to buy. 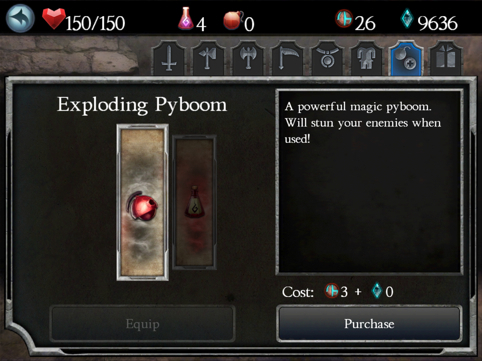 Other In-App Purchases: You'll find blueprints to make new weapons and costume packs that not only come with new outfits, but also extra Pygite and Cores. Crusader of the Light: Purchase Failed...may not be available at this time. OK, so you know your way around that shiny new sword or axe. That's cool, but you'll still run into enemies capable of squashing Horn flat. With this in mind, be sure to keep a stock of Exploding Pybooms and Pygite Potions handy. The former temporarily stuns monsters and lets you score a bunch of hits as a result, while the latter refills Horn's life bar. 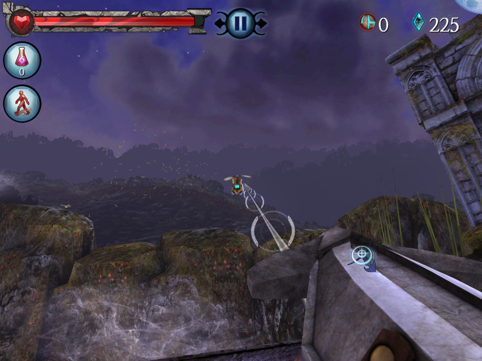 You should always seek every possible advantage, however slight, while fighting Horn's adversaries. 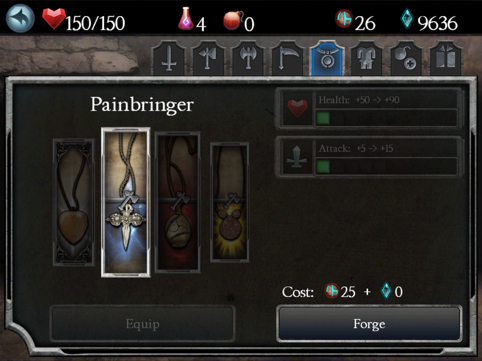 On that note, be sure to equip a pendant while at the blacksmith's forge, granting Horn additional health, attack and critical chance boosts. Don't let all that Pygite burn a hole in your virtual pocket. 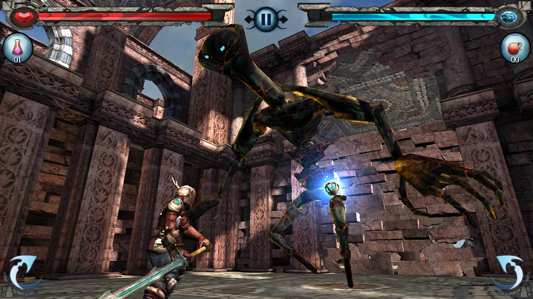 You'll need it to obtain stronger weapons to take down the game's toughest bad guys. 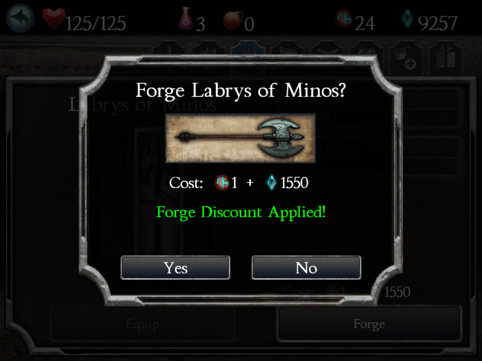 While in the forge, select the desired sword, axe and what not, then click the Forge button. From there, equip that sucker and head into battle. You'll need a weapon's blueprint to create it. That said, always keep an eye out for blueprints within the game world. What's more, you can upgrade weapons and pendants with Pygite and Cores. From The Game: You can forge items anywhere in the game. But if you find a proper forge, creating and upgrading items will require fewer resources and consume less Pygite. If you quit the game and return to the title screen while playing a mission, you'll need to restart said mission from the beginning. Instead, press the iPhone or iPad's Home button to exit, as you stand a greater chance of picking up where you left off. 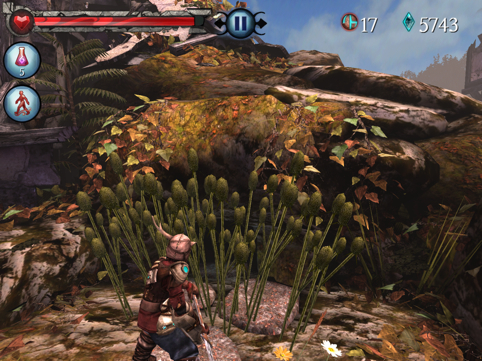 Each monster in Horn has a weak point hidden away beneath its armor. Your job is to locate and then expose it, then hack away until the creature croaks. Don't just stand there slashing blindly. 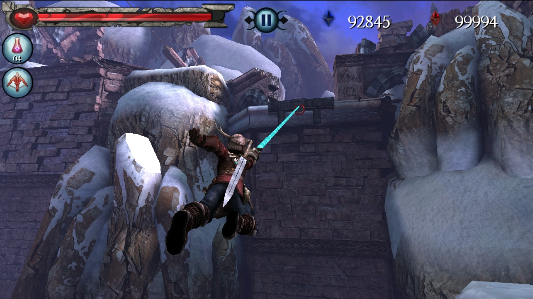 At specific points, the game will offer a means to avoid a monster's attack, such as pressing the jump button at key moments during a fight. 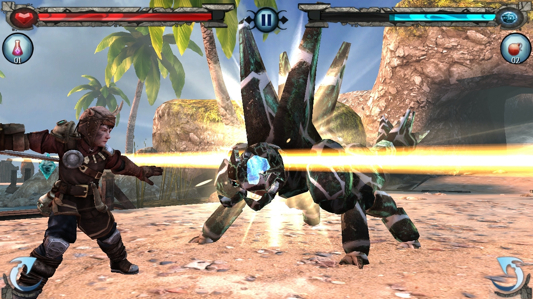 While in mid-air, swipe in the displayed direction to deliver a powerful strike that will temporarily stun Horn's enemy. This will give you a great chance to whittle away the creature's life bar without the threat of retaliation. After Horn learns a song, you can use it to clear debris and reveal paths. In other words, when you see a horn within the environment, blow that sucker. Does a monster prefer jumping attacks, or kick with its hind legs? Perhaps it goes for a devastating claw maneuver. Whatever the attack pattern, the more info you have on your opponent, the better chance of success. And when things get crazy, rely on the right and left roll buttons to avoid taking damage. See a tall patch of grass next to a tiny hill? There's a great chance of finding a tiny passageway behind it. 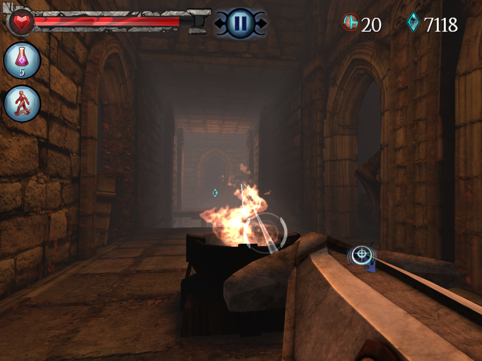 Just hack away with Horn's weapon, then enter to find Pygite crystals and/or a treasure chest. Who knows? You may even uncover the solution to a puzzle. These harmless robots bob up and down through the air. You can ignore them, sure, but nailing these suckers with Horn's crossbow will result in a small amount of Pygite. Speaking of the crossbow, it has infinite ammo, so fire away, fire away. Is there a fire pit nearby? That means you can use it to solve a puzzle that involves firing an arrow directly through the flame, usually towards some patch of shrubbery blocking Horn's path. Confused on where to stand? Look for a patch of land (a square, really) that's a different color than the surrounding area. This one's obvious. 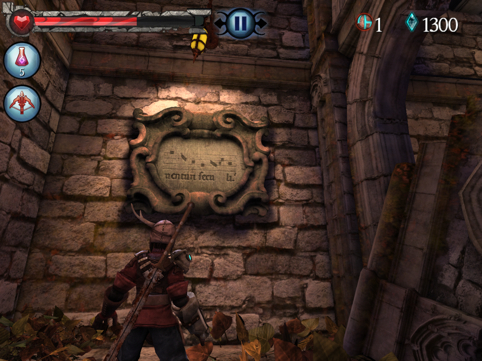 Remember to look up, as you may discover a grapple point that'll lead to treasure chests, cores and pygite. 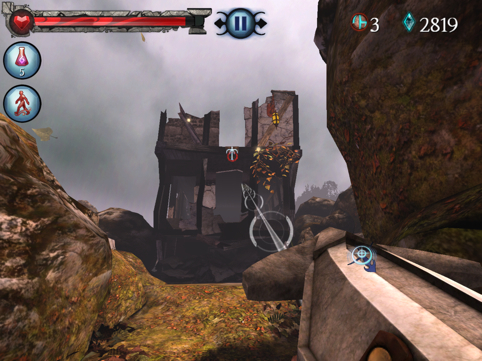 Just head into first person crossbow mode and hit the target. Horn will take it from there.